It is too hot for cooking, but the family’s gotta eat, so cook I must. 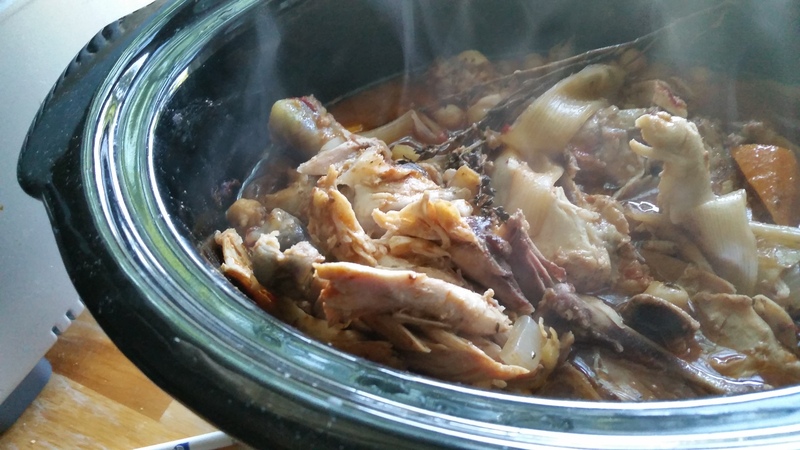 So I have employed the slow cooker; it makes for tasty and tender meals and doesn’t heat up the kitchen. 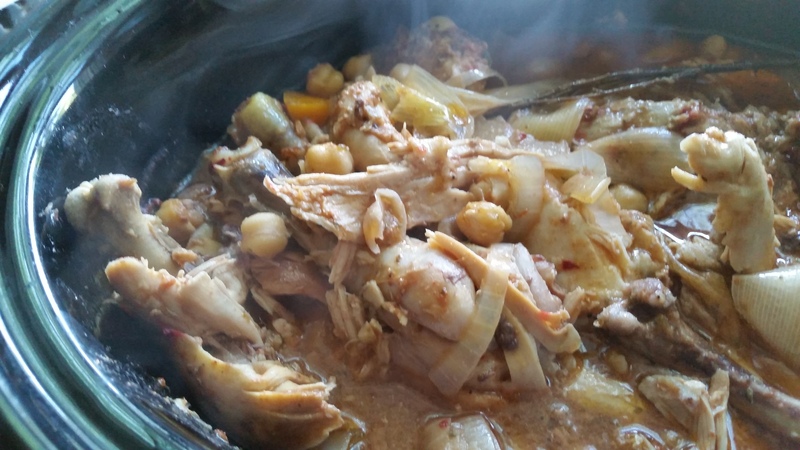 Here is my interpretation of Moroccan Chicken; it was a big success with everyone in the house (the spiciness is pretty mild, just enough to keep things interesting) and took almost no effort on my part! Lay onion, carrots and scallions on the bottom of a large slow cooker. Season chicken pieces thoroughly and add to pot. Whisk together cumin, oregano, harissa, tomato puree, wine, and garlic and pour over chicken. Add thyme and chick peas. Cover slow cooker and cook on high for 3-4 hours, then finish on low for another hour or two. Serve with couscous or rice. May be frozen, but remove bones before freezing. Yet another easy summer hack, this time one that will let your kid practice measuring and keep him or her busy for a hot minute. This one is cinnamon sugar. All you need is one tablespoon of ground cinnamon and three tablespoons of granulated sugar (use white; brown is too crumbly-sticky) Mix thoroughly in a clean container with a lid. The sugar can be sprinkled on buttered toast, muffins, French toast or pancakes, or apple slices that need a bit of help. It’ll keep in the pantry and that’s that! Here’s what I’ve been doing while I have been away from you: organizing a speaker series on global food issues as co-chair of the International Education Committee’s Spring Speaker Series subcommittee at Nassau Community College. Which is to say, I have been super-busy and having loads of fun (but getting a bit anxious too). The series is in full swing now, so here is the schedule (I’m afraid you missed the first day, but there are two more days of events). Featured speakers are my dear friend, Zarela Martinez, whose eponymous restaurant, PBS shows and excellent cookbooks have made her a James Beard Who’s Who honoree, and sustainable food activist and social entrepreneur Ellen Gustafson, who pioneered fashion to benefit the hungry with FEED bags, an idea she made successful with Lauren Bush. Ellen is a veteran TED lecturer…I am so excited!!! Can the Sweet Potato Save the World? One million hectares of land worldwide are planted with potato varieties developed by or obtained through the International Potato Center whose mission is to work with partners to achieve food security, well-being, and gender equity for poor people in root and tuber farming and food systems in the developing world. Joel Ranck, head of the Communications and Public Affairs Department at the Peru-based International Potato Center will Skype in to the college to explain the role of his not-for-profit agency in defeating poverty and world hunger and answer questions on how scientific and genetic research can further these goals. Professor Carolyn Monastra will be using photographs and stories from her project The WItness Tree in a discussion about the effects of climate change on global food production. The negative impacts of extreme storms, sea level rise, drought, water rights, and global land grabs will be discussed along with positive solutions like permaculture, WOOFING, CSAs, and food-coops. 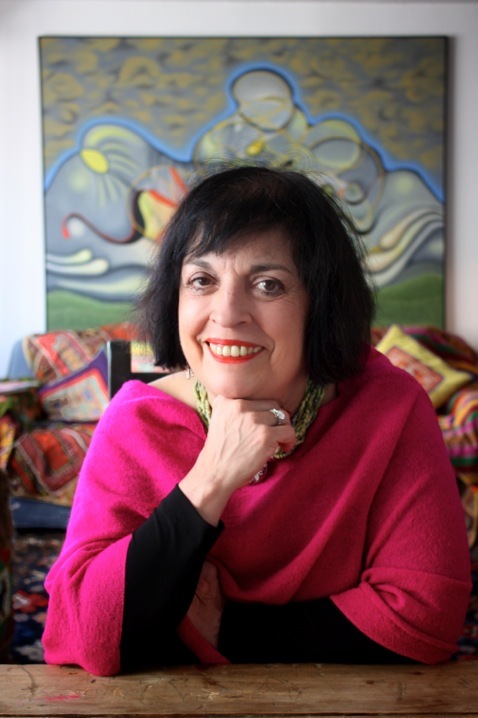 Zarela Martinez Talks Mexican Food and Culture: The James Beard Foundation Who’s Who of Food & Beverage honoree, PBS food personality, cookbook author, historian and restaurateur who pioneered real Mexican cuisine in New York discusses her career, her journeys and her varied national cuisine. Zarela Martinez returns to discuss Latino-Americans: Re-branding Ourselves in the New U.S. Landscape, covering career and business outlooks for Latino entrepreneurs and those who want to understand the growing Latino market. NCC students present their exploration and research into the many ways different cultures and religions find spiritual nourishment through food. Ellen Gustafson is a sustainable food system activist, author, innovator and social entrepreneur. Her first book, “We the Eaters: If We Change Dinner, We Can Change the World” was published by Rodale Press in May 2014. She is the Co-Founder of Food Tank: the Food Think Tank, with Danielle Nierenberg. She is also founder of a small sustainable home goods company called the Apron Project. Before the launch of Food Tank, Ellen founded the 30 Project, a campaign that has helped to change the conversation about the global food system by connecting hunger and obesity. She is also the creator of the ChangeDinner campaign and HealthClass2.0, which are helping individuals change the food system at dinner tables and in schools. The top problems for humanity for the next 50 years will be energy, water and food. Professor Birgit Woelker says agriculture and the way we produce food provides hope for a clean and sustainable future. Ellen Gustafson, veteran of three TED lectures and founder, with Lauren Bush, of the FEED bag project, returns in the afternoon for a second lecture, this time on Social Entrepreneurship. 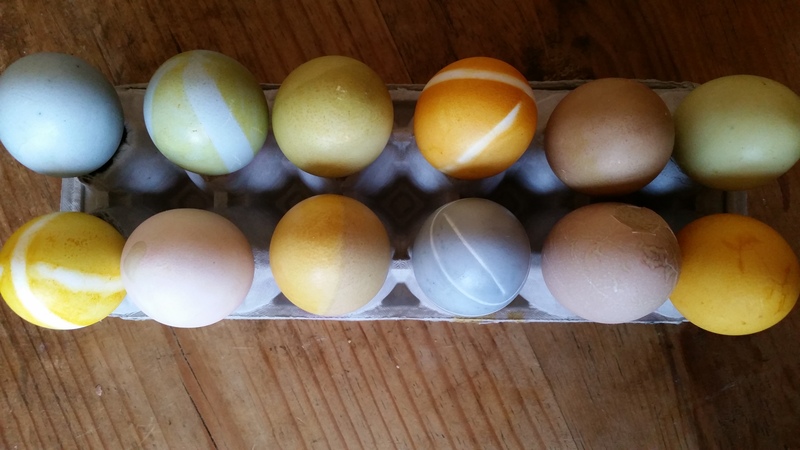 It’s been a busy Spring at our house and although I have been rather out of touch, there HAVE been delicious things going on in my little kitchen. 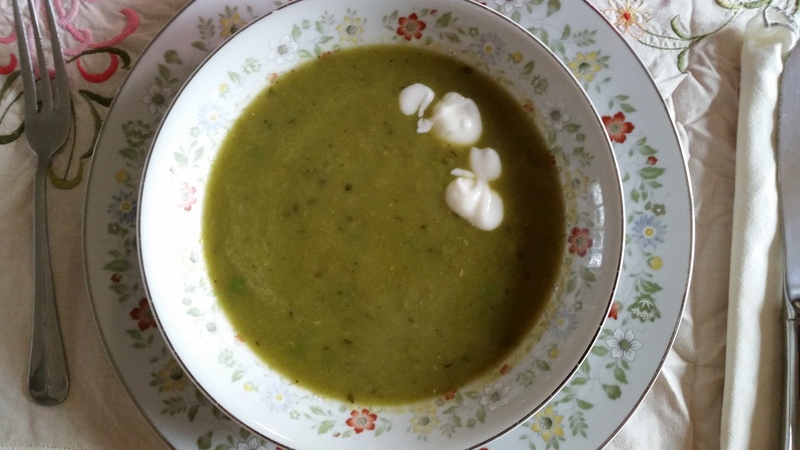 This was our soup for our Easter meal and since it is lovely and simple and seasonal, I knew I would eventually get to sharing it with you! 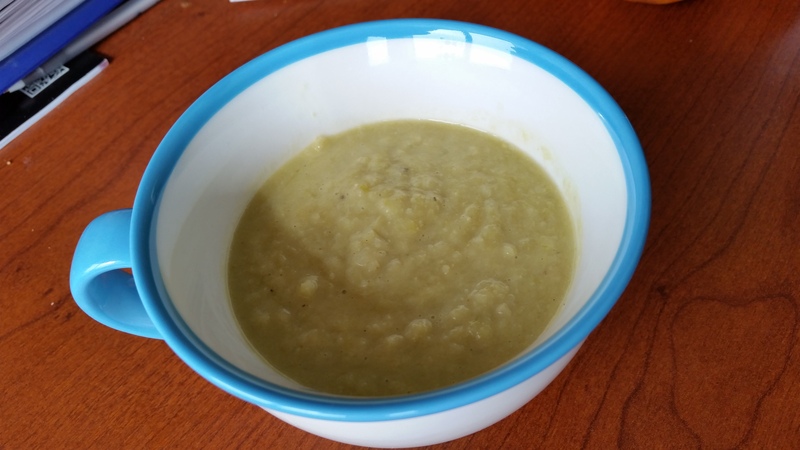 It is almost like a bisque, because the texture is that creamy, but there is no cream or milk! This was a delightful starter for our Spring meal! In a soup pot heat the oil and butter at medium high. When the foaming subsides, add leeks, stir to coat and lower heat to medium. Cook the leeks, stirring occasionally, until very soft, adding the thyme after about 5 minutes. Add the peas (setting aside that extra ¼ Cup) stock and nutmeg, Bring to a steady simmer and cook for 15-20 minutes, until the peas are very soft. Using an immersion blender, blend until smooth. Add the remaining peas, salt and pepper and serve with croutons, if desired, or a dollop of plain yogurt. 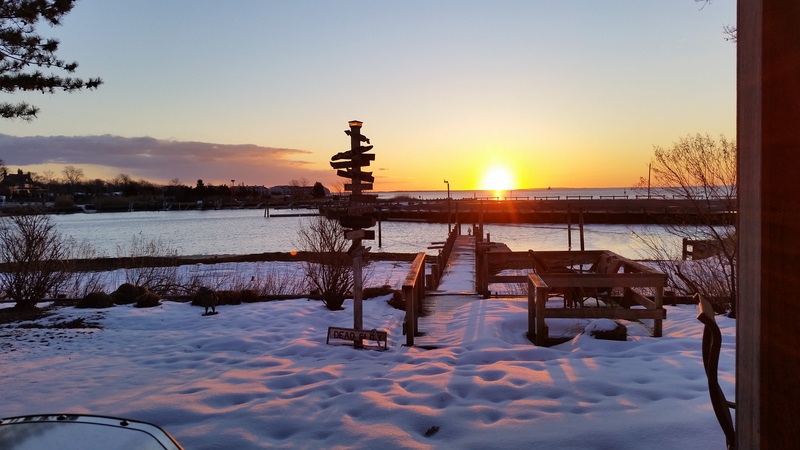 We recently had a wonderful weekend out in the wine country – Long Island’s North Fork is one of our favorite places to go…farmland, vineyards, the bay and the sound on either side and dear friends we’ve made over the years. I had a baby shower to go to, so after a bit of lunch at Love Lane Kitchen with our friend Ashley and a little wine-tasting (me) and Scrabble (them Exhibits A and B) across the street at the Roanoake Tasting Room, I took Leandro to our friends Vinny and Carolyn’s to hang out while I met Ashley back at the joyous shower at Paumanok Vineyards. The bacon theme seems to have started at dinner for them, as they ordered him bacon mac and cheese at the Blue Canoe. 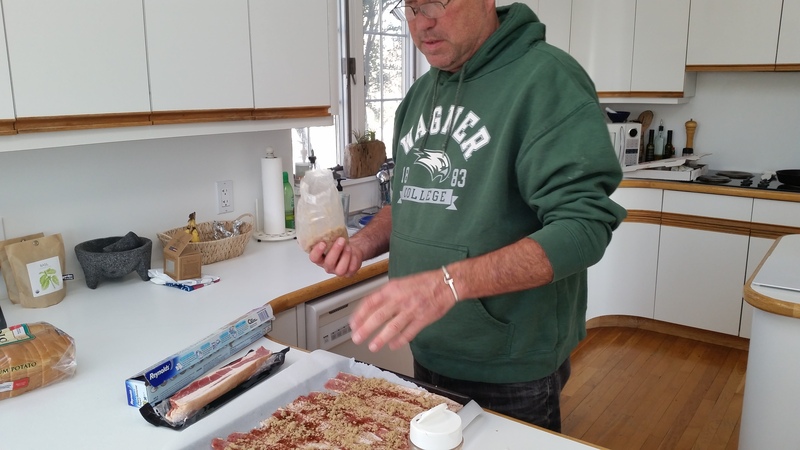 And then the next morning it was bacon again, but this time Vinny upped the flavor profile, introducing us to his decadent Brown Sugar Bacon, which he says is a simplified adaptation of something he had elsewhere. It is barely a recipe, more of a seasoning, but the results are salty-sweet, crispy and juicy and I will be doing it here at home this weekend. I am hooked. Mind you, with hospitality like that, it’s a wonder Vinny and Carolyn ever get rid of us! Preheat the oven to 425°F. Cover a rimmed baking sheet with parchment paper. 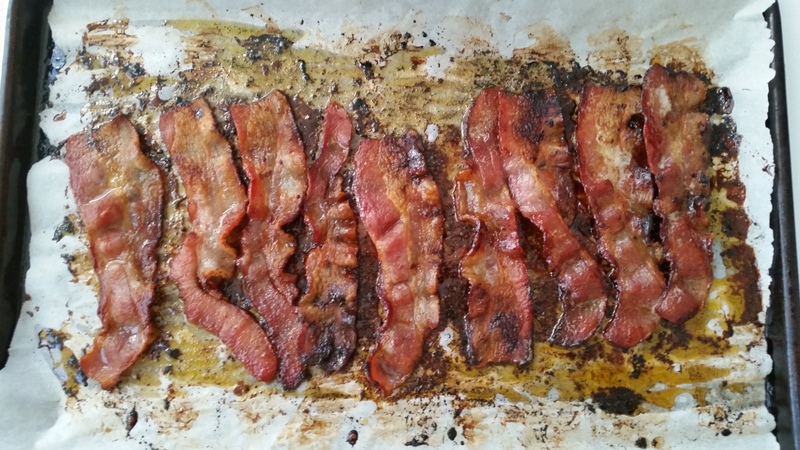 Lay the desired number of strips of bacon flat on the paper. Sprinkle generously with sugar. 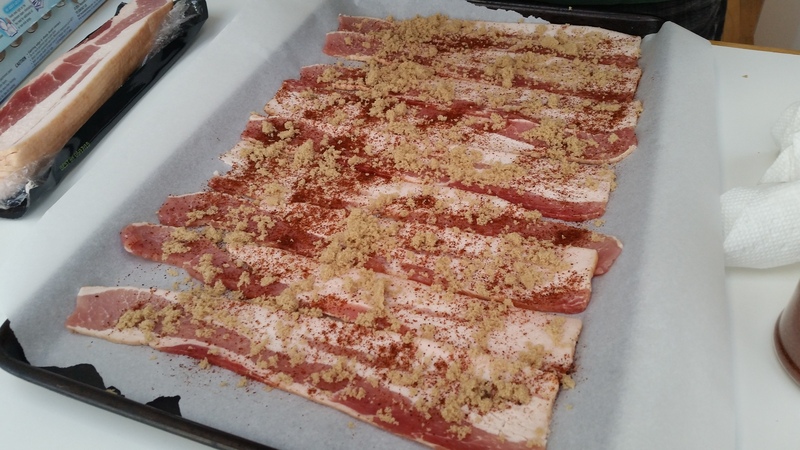 Place in the oven and cook for about 10 minutes or until you start to smell that bacony smell. Turn and cook another ten minutes or until you reach the desired crispness. Serve with whatever breakfast food you like! Today was yet another snow day in a winter that has been the coldest in decades and during which we’ve been snowed on an awful lot. Most of us are well sick of the disruption and the winter coats and gloves and hats and the shoveling and the slush. The bakers did very well! But there are small pleasures with unexpected days off…like sleeping in and — if your seven-year-old shuts up long enough to allow you to complete a thought or a blog post or pay a bill or anything for the love of God — finishing little tasks you wouldn’t have time for otherwise. And then there’s baking, because the best defense against the bad weather blues is a house that smells like sweet, warm, doughy things. 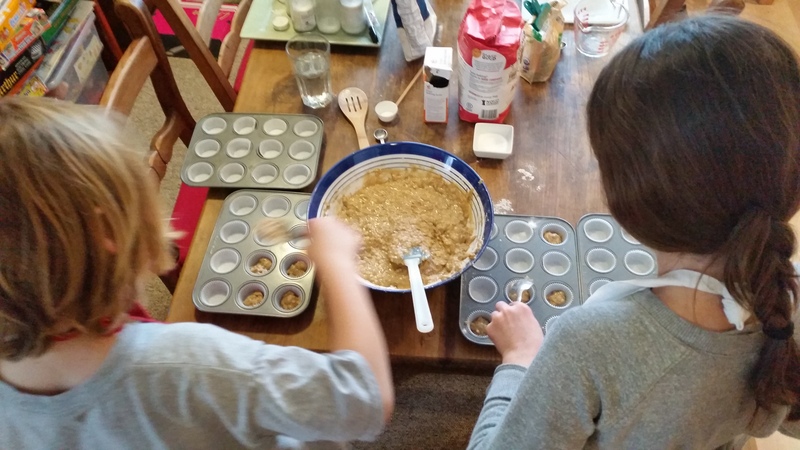 The muffins were not all exactly the same size, but that’s part of the charm of home-made! 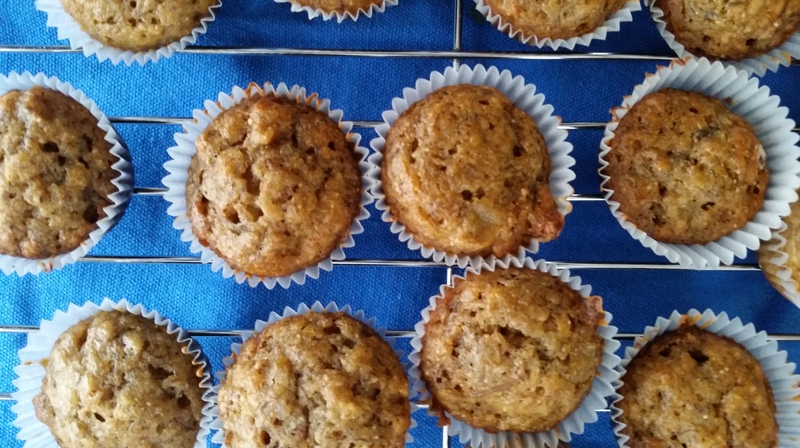 So I decided to try a simpler version of our Banana Walnut Maple muffins with my little man and his friend from across the street after they’d been playing in the snow for a couple of hours (remember when you considered that kind of thing fun?) and I had actually completed one report. It was a great success, both the making and the fragrant baking and the tasting, plus being able to send the neighbor home with muffins for her family and having muffins for the guy on the corner who cleared the driveway with his snow blower and for the sweet couple in their 90s across the street. 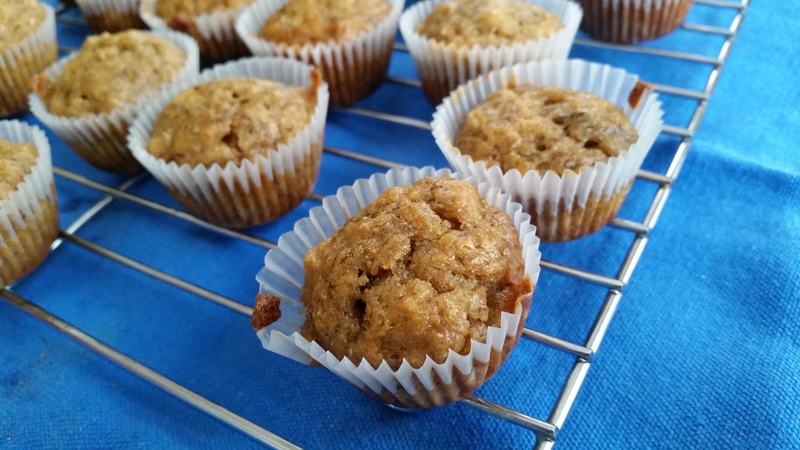 Mini-muffins go so much farther than standard size muffins! And we still have plenty left over for lunchboxes! 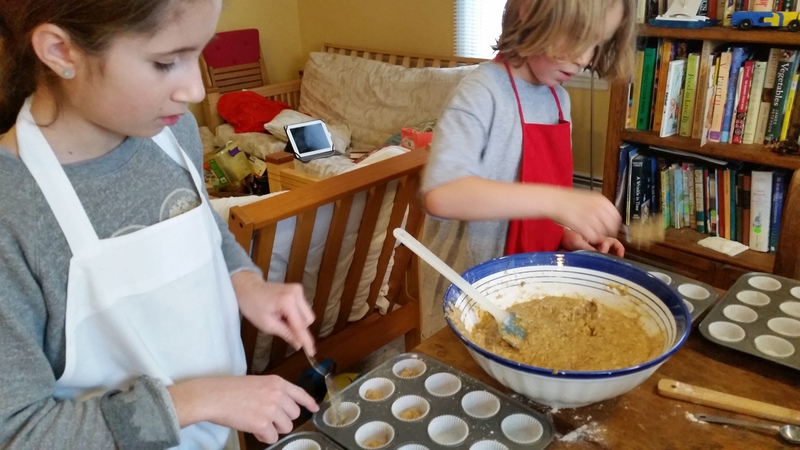 Preheat the oven to 375˚F and grease or line with cups 2 standard muffin tins (12 muffins) or 4 mini-muffin tins (48 muffins) plus be ready to do an additional six standard muffins. This makes a lot. In a large bowl, mix the dry ingredients: flour, baking soda and salt. In another, mash the bananas, then add the sugar and mix well with a fork. Add the melted butter, egg, vanilla and beat well. Fold in the dry ingredients and mix until just combined. Fold in the nuts and maple syrup gently with a rubber spatula. Spoon the batter into the muffin tins to fill about halfway. Bake 12 minutes for mini-muffins and 20 for standard muffins. Allow to cool for a minute before planning them on a rack to cool further or just serve warm. 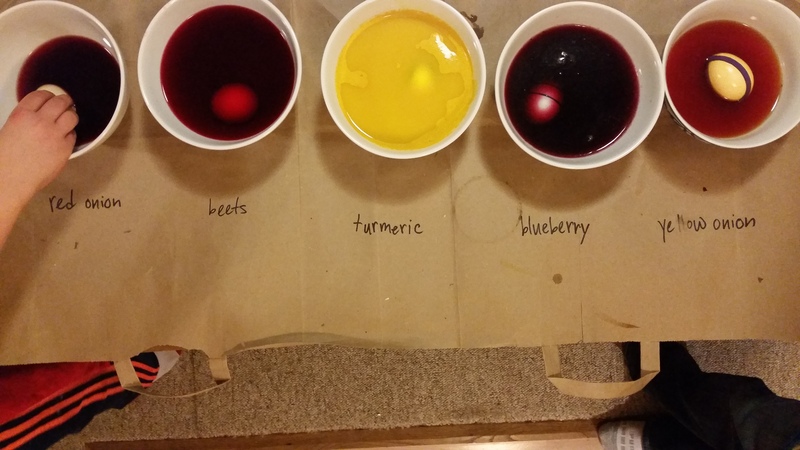 These store well in an airtight container for about three days and also freeze well. I take them out of the freezer and pop them into my son’s lunchbox frozen and they are good to go by snack time. Here on Long Island we are having one of the coldest winters on record. 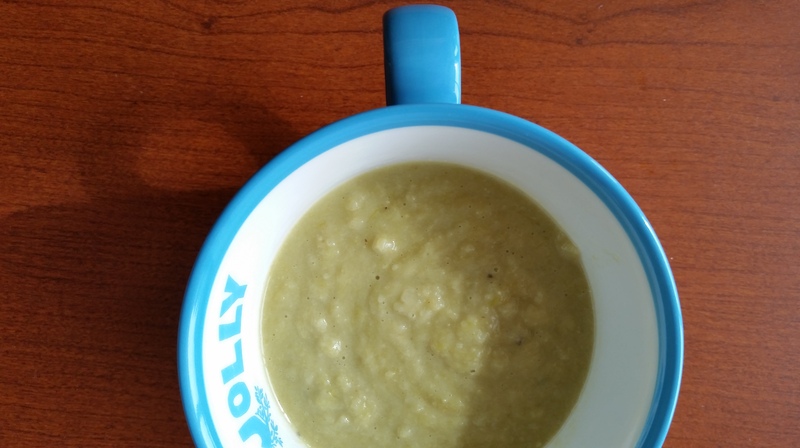 Since you can’t reasonably spend the entire winter drinking hot toddies all day — as much as the idea appeals –, the second best, more sensible and certainly more sustainable response is soup. Here is an easy-peasy soup recipe that is warming and light, inspired by my dear friend Deborah Rivera Pittorino’s matchless soups at her restaurant La Cuvee Seafood & Grille in the heart of Long Island’s North Fork wine country. She shares some her recipes on her blog, The Seasoned Fork, by the way. This recipe adds a little nuttiness (nutty flavor, not crazy person nuttiness) by dry roasting the cauliflower for 10 minutes. This amount makes four appetizer servings or two meal-size bowls and reheats really well in the office microwave for lunch! On a baking sheet or in a baking pan roast cauliflower at 400˚F for about 10 minutes (I do it in my fancy, full-service Breville toaster oven) until getting browned at the edges. In the meantime, heat the olive oil and butter in a heavy-bottomed soup pot at medium. When the foaming subsides, add the leeks. Stirring occasionally, allow the leeks to get very soft (5-10 minutes). Add the cauliflower, stir and cook a minute or two. Add the stock, bring to a boil, then add curry, lower heat, add milk and simmer for at least 30 minutes, until cauliflower is falling apart. Using an immersion blender or (in batches) a blender or food processor, blend until you reach the desired smoothness. Season to taste and serve, topped with a dollop of plain yogurt or croutons if you like. 17 More Warming Winter Soups! If you Google National Pancake Day, you will find a variety of dates, from September to Shrove Tuesday (before Lent) to this coming Tuesday, March 3, as declared by IHOP (International House of Pancakes). So I hereby declare that Natalia National Pancake Day shall be any day that I don’t have to be up at 5:30 a.m. and out by 7 for work and that my son wants to make them and I have the ingredients. 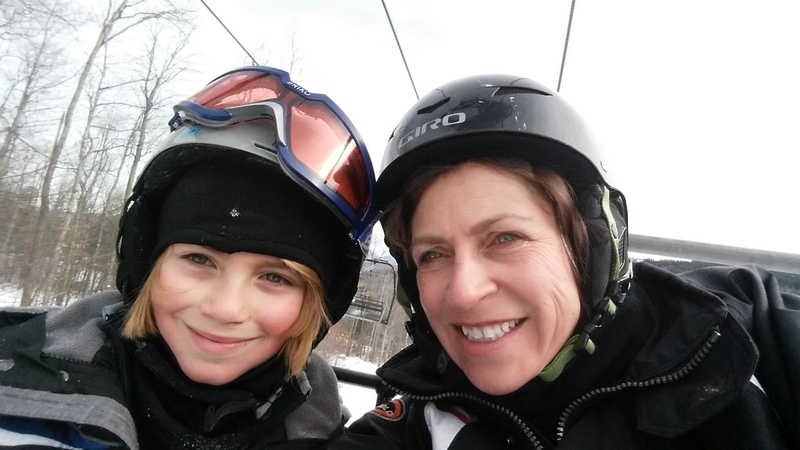 Yes, it is many degrees below zero and we are on a ski lift…am I smiling or grimacing? 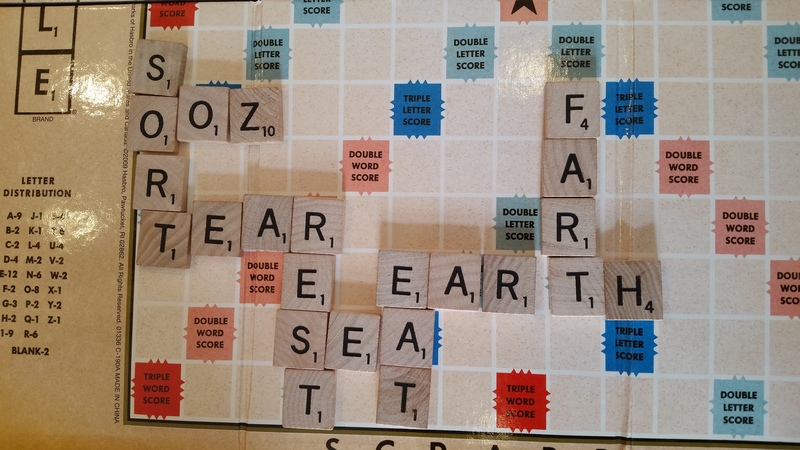 Those stars aligned during the recent winter break from school. 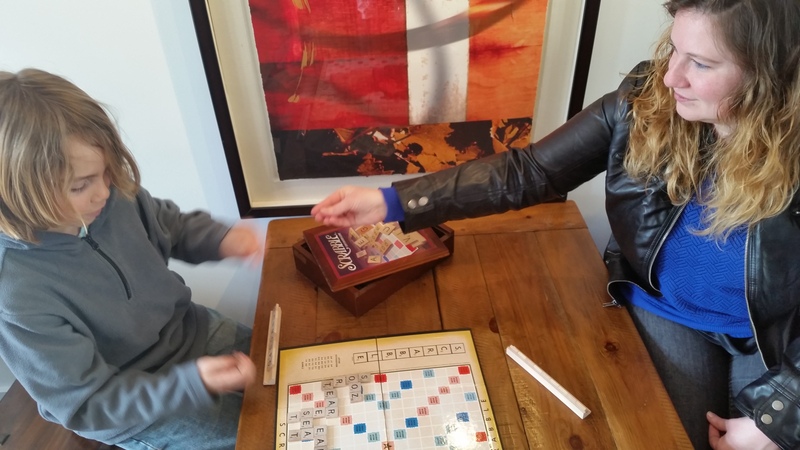 We spent the first part of the break with dear friends Adriana and Micaela at Adriana’s sister and brother-in-law’s in the Lake Placid area (because it wasn’t cold enough downstate at -7ºF so we went for -27°F? Eek!). It was a terrific weekend of learning to ski and snowboard and snow shoe (and becoming almost casual about jumping the frozen battery of my car) and actually enjoying winter. 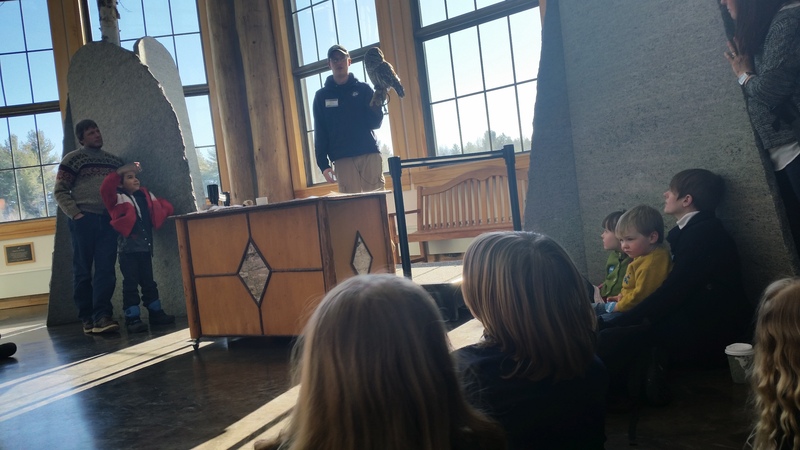 But one day we decided to go to The Wild Center at Tupper Lake, a beautifully designed nature museum full of Adirondack flora and fauna that you could admire in the sunny and well-heated indoors. 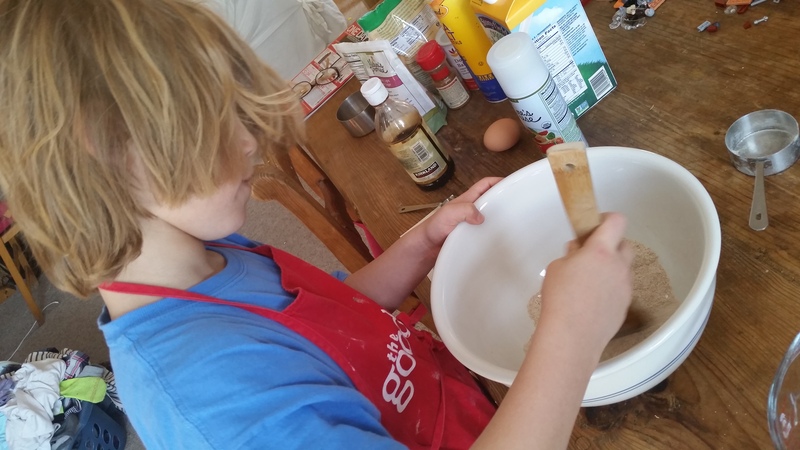 Funnily enough, they had recipe cards, one of which was for whole wheat pancakes, which the little man decided he wanted to make when we got home. 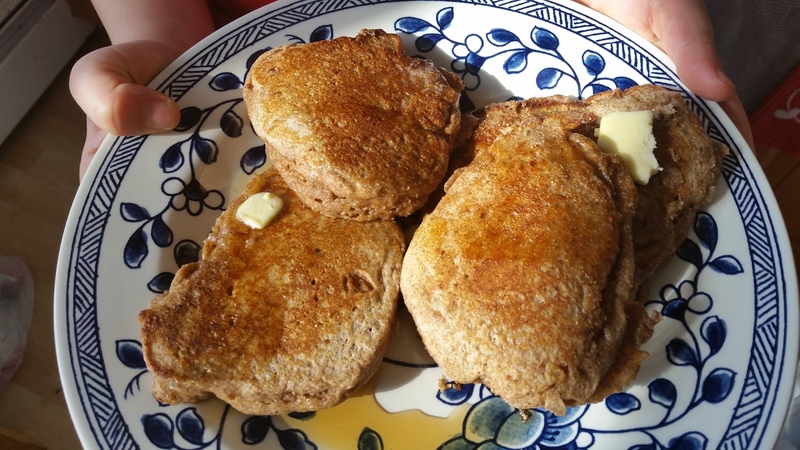 The original recipe was for 14 pancakes, so we halved most (not all) of the ingredients, keeping the cinnamon and vanilla at full-strength, and adding homemade cranberry-blueberry jam. The original recipe card Nice, right? 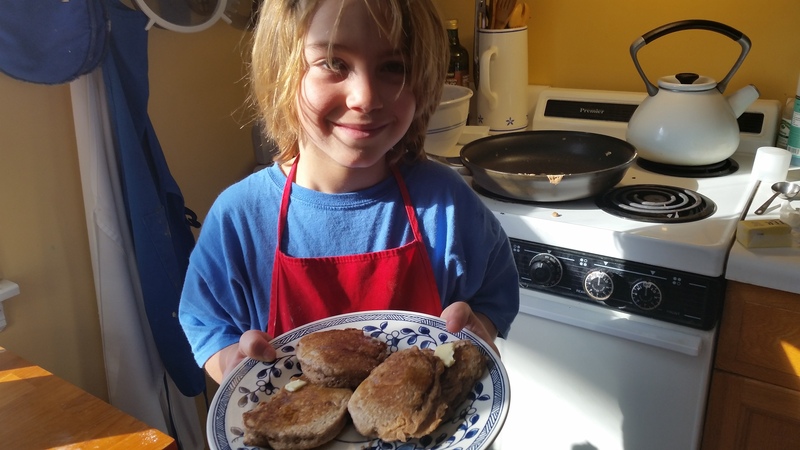 The little guy has really graduated to following a recipe, measuring and cooking on his own, except for the odd difficult pancake flip and one mild burn, so that was very cool. We really liked the almost cake-like lift that the baking powder gave them. 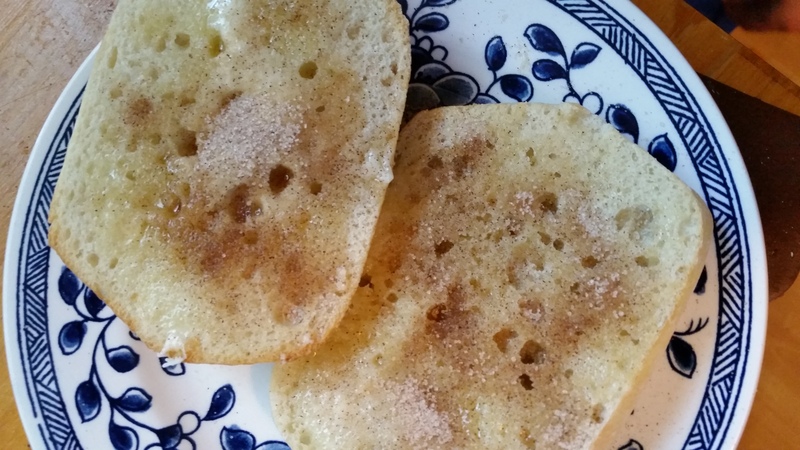 Not too sweet and very cinnamon-y, these were pancakes we will be making again and again. Mix all dry ingredients together in a bowl. Add wet ingredients and mix until there are no dry spots, then stop right away. You can swirl in a couple of tablespoons of berries or jam at this point, or do it after you’ve made some plain ones, then add the berries to change things up. Heat a large skillet over medium heat and melt a knob of butter. 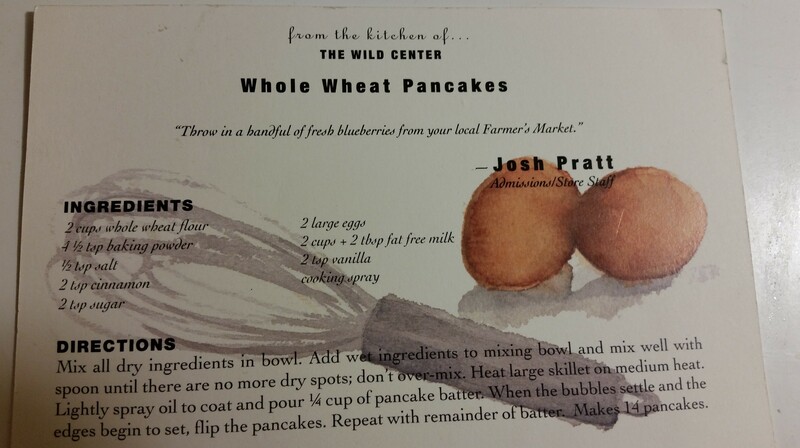 When the foaming subsides, spoon batter into skillet ¼ Cup at a time, leaving plenty of room for each pancake. The surface will start bubbling. When the bubbling settles and the edges look set, it’s safe to flip. Cook till the edges set again, remove and stack on a warm plate and start another batch, adding butter to the skillet as needed. We’re approaching the second Friday of Lent (and my second week without cheese, Lord help me). It’ll be tuna salad for lunch tomorrow, but not your run-of-the-mill deli style tuna salad. I like my flavors a little bigger and bolder (except for the tuna, which I confess to liking on the milder side; I prefer albacore and try to purchase ocean friendly brands). Here’s my easy way of making tuna salad special. I am trying to keep the carb load down, so I’ll just have my tuna salad with lettuce. To one 5 oz. 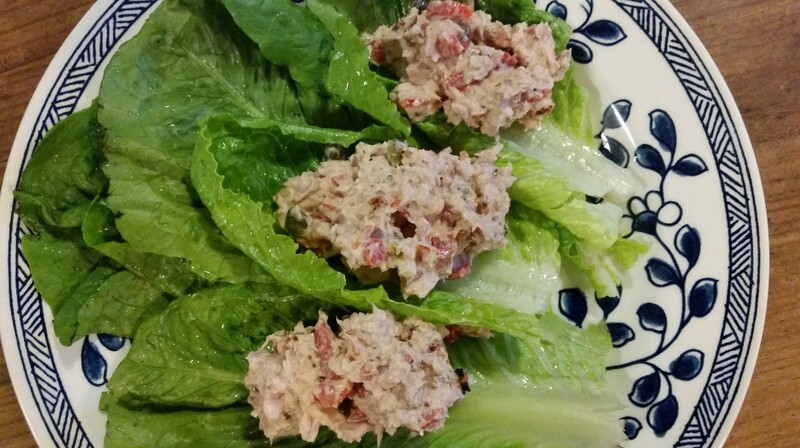 can tuna, drained, I add 1 Tbs prepared mayonnaise and 1-2 tsp each of prepared mustard, drained capers, chopped sun-dried tomatoes, chopped onion, and chopped roasted red pepper. Mix well, season to taste, and serve on bread or salad.